Smartphone and tablet processors are just about entering the dual-core stages of their evolution and Freescale wants to join the party. Not only this, the company is even willing to throw a quad-core CPU our way just for the fun of it. Freescale just announced a trio of new mobile processors, suitable for use in Smartphones, Tablets and eReaders. 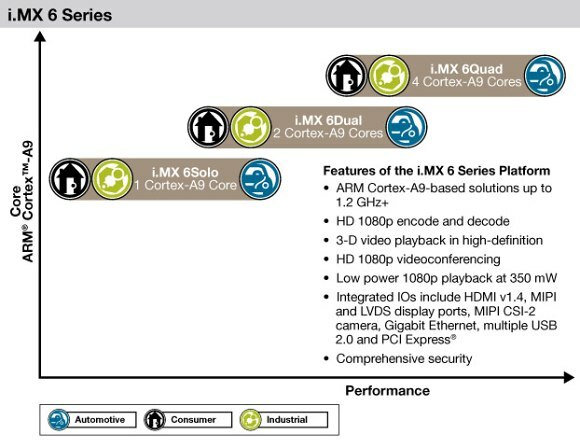 The three versions of the i.MX 6 CPU are called Solo, Dual and Quad and come with one, two and four Cortex A9 cores respectively. Each of the cores can be clocked at up to 1.2 GHz. The level 2 cache isn't quoted for each of the CPUs but Freescale says it reaches 1 MB (presumably on the quad-core unit). Freescale plans to start sampling the new CPUs later this year, which isn't nearly as specific as we hoped to get. Anyway we don't expect to be seeing one of those babies on an actual tablet or smartphone before the next holiday season.